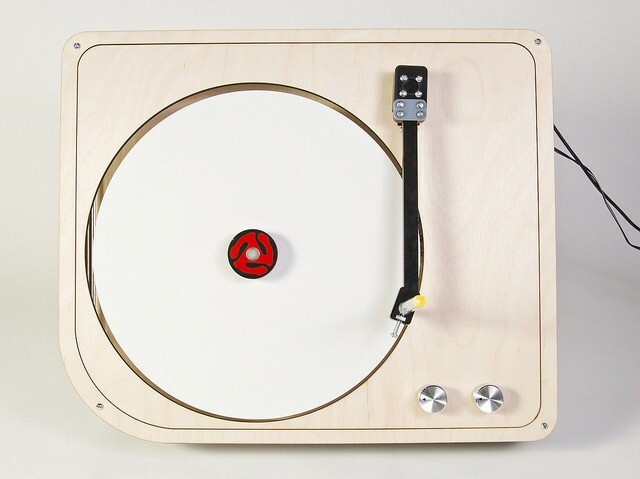 The Turndrawble is a drawing machine I designed, based loosely on an old vinyl turntable, but instead of playing records, it creates drawings. 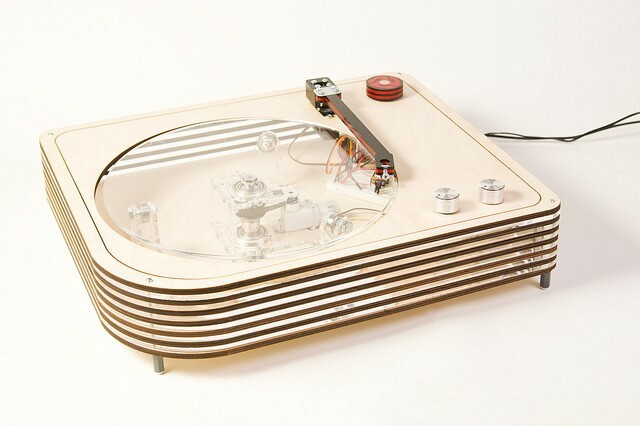 The construction was done using stacked layers of wood and acrylic. I wanted to avoid using the typical laser-cut “box” enclosure I usually use. I’m pretty happy with how it turned out. The Turndrawble is meant to be used to create 12″ circular drawings. One of the knobs controls the platter speed, and the other sweeps the arm in and out. Since it’s a new drawing device, it hasn’t been mastered yet, but we’re working on it! Here’s a short video showing the turndrawble being operated. I’ll probably have it at some future art events for people to try out and see what they can create with it. There’s a bunch more info about this thing on the Turndrawble project page on my web site. 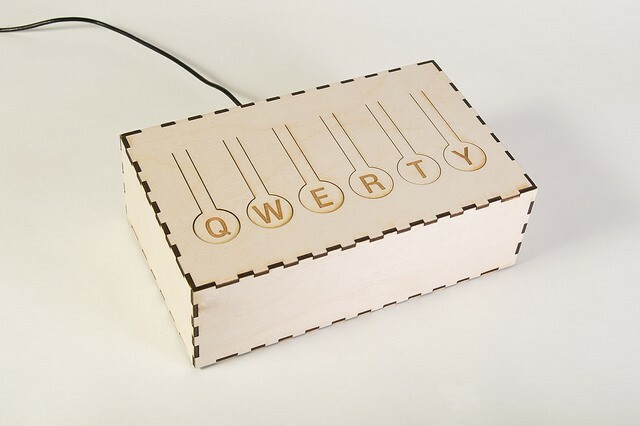 I built a QWERTY keyboard that types the letters Q, W, E, R, T and Y, and nothing else. No space, no return, no escape. I wrote plenty more about this project on my blog, and if you want to read about the history of the QWERTY layout, and its connection to Milwaukee, and why the way we interact with technology is interesting and sometime ridiculous, well… I got that too. MegaMax has been and continues to be my main project for the last 2+ years. I am currently working on some upgrades that will make him more Mega and even more Max. The Y axis is being converted from belt drive to screw drive and the round guide rails are being replaced with linear guides and bearing blocks. The X-axis will also get converted to linear guide and bearing block and change from 5mm pitch belt to 2 mm pitch belt drive. I feel confident saying that once these modifications are complete the flaws/errors in prints will be due primarily to the nature of liquid plastic squirting through a nozzle, not positioning system errors. Don’t ask me why I do this- I have no choice. Back in June we announced some Instructables Build Nights featuring littleBits and the new Arduino at Heart modules. We had a lot of members play with the ‘Bits during the last six weeks, and we’re still waiting for Steve to publish the detailed instructions on his “littleBits-powered Vomit-Inducing Machine”, but for now we’ll have to make do with the littleBits Arduino Annoying Machine that Eric and his son built. I also got in on the action, with two Instructables that (sort of) go together; littleBits Serial Data and littleBits Serial Controller. All of our projects make use of the Arduino module, which add some great programming functions to the littleBits world. If you didn’t get a chance to play with the ‘Bits yet, we will have four littleBits Deluxe Kits and a bunch of Arduino modules at the space to experiment with. They should be treated like a LEGO set; build something, then take it apart. Hopefully having some fun and learning something new along the way. Have you heard of littleBits? It’s an open source library of electronic modules that snap together with tiny magnets for prototyping, learning, and fun. If you’re the kind of maker who tends to avoid the Electronics Lab, littleBits might be just what you need to start experimenting with circuits. 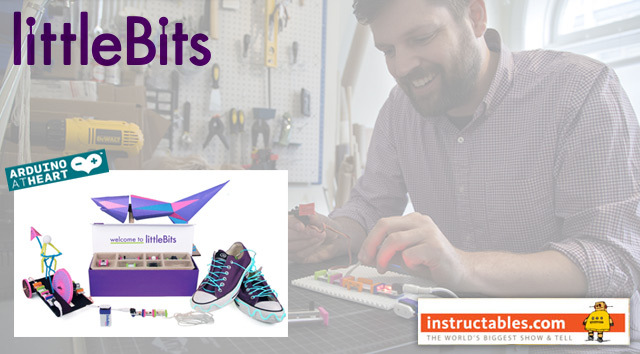 We’ll be hosting a number of littleBits Build Nights in June, sponsored by our friends at Instructables, who have provided us with a bunch of littleBits Deluxe Kits, as well as a number of their new Arduino at Heart modules, which let you add an Arduino brain to your littleBits creations. If you come up with something cool, we’ll help you post a step-by-step Instructable for it, so others can enjoy your creation. If you need some inspiration, check out some of these littleBits projects. These events will be free, just bring yourself (and your ideas!) to 2555 S. Lenox St. in Bay View and make something cool with littleBits.